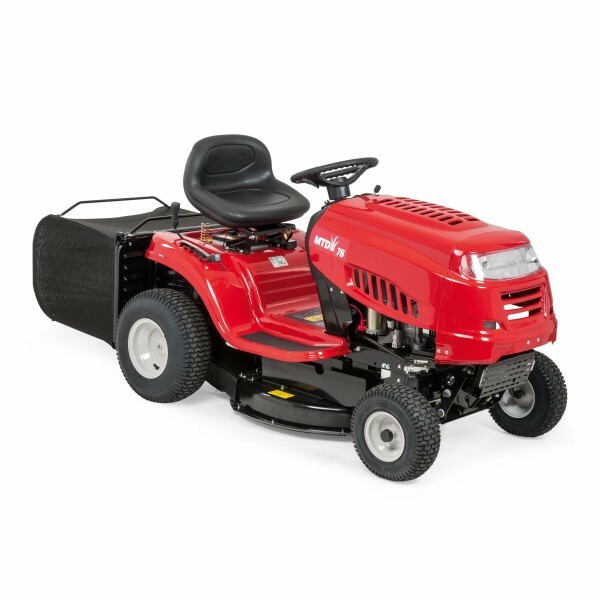 Product code: MTD76 Categories: 4-Stroke, Lawnmowers, Ride On. The MTD 76 Lawn Tractor tractor features the single blade ‘Direct Collect’ system which uses a large turbo fan assistor in combination with a heavy duty blade to throw and blow grass cuttings, leaves and other debris directly into the collector. Because the cutter deck is offset to the left hand side, these ride on mowers are capable of cutting right the way up to lawn edges and obstacles. An infinitely variable foot operated transmission allows for smooth, change on the move, acceleration which quickly allows you to reach top speed, as well as permitting slower speeds where caution is required. This gives the operator the benefit of efficient and safe operation in confined areas. If collection is not required, or the conditions are extreme for it, the Lawnflite 603G tractor can easily be converted into rear discharge tractors with the use an integrated rear ejector chute. The removing of the rear catcher also makes the MTD 76 Lawn Tractors very practical for storage. Fitted with a tow bar designed specifically for the whole range of Agri-Fab trailed equipment, making these tractors extremely versatile. The TS 138 is a user-friendly tractor ideal for homeowners having small to mid-size gardens. It is an efficient tractor with side ejection, smart design and ergonomics. Has a powerful Husqvarna Series engine with choke less start and convenient pedal-operated transmission. Can be complimented with a collector and BioClip cover. The Lawnflite RC125 Garden Tractor has a cutting width of 76cm/30", with a 12.5hp Briggs & Stratton petrol engine. This lawn tractor features a semi automatic transmission allowing the user to pre-select a gear and then just use the speed control pedal to control speed rather than continually having to change gears.A major feature of this garden tractor is the floating deck, which increases the air flow in the deck, giving the 603 RT class leading grass collection ability for a single bladed garden tractor. Another innovation feature is the integral flip down rear discharge chute that automatically drops into place when the grassbox is removed. Worth noting is the extremely tight turning radius of 46cm/18", which is considerably smaller than most garden tractors of its size. Also important is the step through chassis design, allowing very safe, easy mounting and dismounting. The integral tow bar enables the use of all Agri-Fab trailed equipment, each one designed to make your investment in this garden tractor work harder for you. The tractor's grass box is easily emptied from the seat and holds an impressive 200 litres of grass. Ideal for cutting areas between three quarters to one and a half acres of grass. The Lawnflite Pro 553HRS-PRO Roller Lawn Mower is a 53cm/21" roller rotary mower that features a top quality Honda engine. The drive to the roller is shaft rather than belt driven, which is more positive and heavy duty than the belt alternative. The extra features this model gives you over and above a standard 553HRS are, strengthened handle brackets, a deck liner for extra protection and also a front bumper bar which again helps protect the deck from accidental damage. The deck is made of high quality alloy, which because it is rust proof obviously adds to the long life of the machine. The all steel rear roller will give the garden the much sought after 'Traditional British Stripe'. It also has the advantage of making the cutting over lawn edges much easier and the likelihood of damage to those edges is much reduced. The Husqvarna GX 560 petrol hover mower has all the benefits of a hover mower with the added freedom that a petrol lawnmower brings. By floating on a cushion of air the GX 560 is lightweight easy and to manoeuvre, enabling the user to cut the grass easily in awkward and difficult to cut areas of the lawn. Designed for large-scale domestic and semi-professional use the GX 560 hover mower features a powerful, high quality engine for use on slopes of up to 45°. Husqvarna LB 553S e is a reliable and dedicated BioClip mower, designed for tough, professional use. The design has focussed on achieving the best possible ergonomic conditions for the operator and an extra-ordinary cutting results, even in wet weather. The cutting width is 53 cm and the central cutting height adjustment is spring loaded to make adjustment as easy as possible. Front-wheel drive for optimal handling and light-weight wheels of aluminium, with double ball bearings and rubber tyres. LB 553S e has an easy-start Honda OHC engine and is also equipped with an ergonomic and side adjustable handle included an effective Anti-Vibration System. The TC 138 is a user-friendly tractor ideal for homeowners having small to mid-size gardens. The tractor that offers excellent collection of grass clippings as well as leaves, giving tidy cutting results. The spacious, integrated collector is easily emptied from the drivers seat. Equipped with a powerful Husqvarna Series engine with choke less start and pedal-operated hydrostatic transmission. BioClip plug and deflector for rear ejection is available as an accessory. If you want a real Husqvarna ride-on mower, with its ability to navigate around flowerbeds, bushes, trees and other obstacles on your lawn, but dont want a Rider for the largest lawns, Husqvarna R 112C is the perfect choice. The compact design of this small ride-on mower ensures easy handling even in tight spaces and makes it easy to store. Despite the smaller design of this rider, it offers excellent traction even in slopes and wet conditions. Articulated steering lets you turn quickly with a minimal turning radius. And the front-mounted cutting deck gives you an excellent overview of the mowing area. The LMinirider60RDE has Transamtic Transmission, the speed can be simply adjusted with the foot pedal, just select forward or reverse direction and press the foot pedal to go. No stop start changing gear. Smooth gearless change of speed. If you cut around a third of an acre up to one acre and are looking for a tractor that easy to store thanks to its small dimensions, then this may well be the choice for you. This Lawnflite ride on mower also features an optional 3 in 1 cutting system so you can collect, mulch or discharge, ensuring that you have plenty of choice on how to handle your grass clippings.Optional Mulch kit part number196-707-678.